DESCRIPTION: You'll notice that the snout is pointy. Nature has equipped all species of snakes with very specific features designed to help them adapt to the environments in which they live. Some have skin that is of neutral colors to help them blend in and hide from predators – or even use as a camouflage to hide from prey. Some snakes have sensory organs inside their mouths – such as in the case of the pit viper species – that helps them to easily find their prey while hunting at night. The Florida scarlet snake is equipped with a special feature as well. Since it is, in effect, a burrower – one who makes its home in sandy soil, under tree bark, rocks, soil, and leaves – nature has equipped this species of snake with a pointed snout. 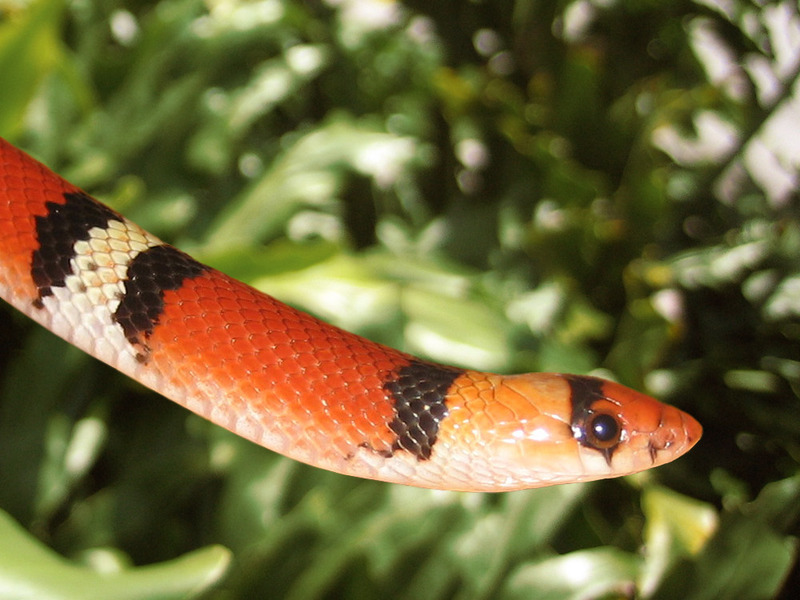 The snout of the Florida scarlet snake curves upward slightly, and makes a very effective “shovel” to help the snake get “underground” quite efficiently. When you consider that this animal has no claws with which to dig his home or his resting place, a pointed snout that acts as a shovel serves this snake quite nicely. It is also very helpful as this species of snake is rarely seen by humans due to its secretive nature, and would need to burrow in a hurry to avoid contact with an approaching person. The pointed snout comes in handy when accessing food as well. While the Florida scarlet snake enjoys hunting small lizards, rodents, and the like, it also has a particular affinity for reptile eggs. It is able to swallow the egg whole, or using its pointed snout, is able to break the shell and consume the contents that way. When you consider this snake’s habitat and what is on its menu, it is easy to see that the snake is well-equipped for whatever challenges come its way.